For over a year now I have been watching the Foster Kitten Cam, which shows live video of mother cats and kittens being fostered before adoption. 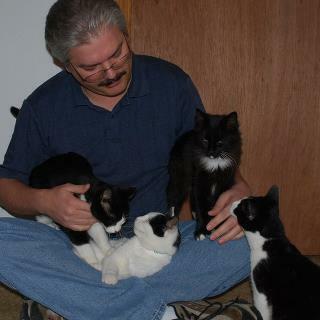 Foster Dad John takes in the cat family, usually shortly after birth, and keeps the mother and kittens in a special room. He provides shelter, food, and toys, but most importantly human interaction, so the cats become socialized. I find John's attitudes and behaviour to be an inspiration, and consider him a worthy role model, not only as a cat fosterer but as a person. I should stress that I only know John's public persona, as expressed when he appears on the cam, on the chat, or on his Facebook page, The Critter Room. However, I believe this is a genuine reflection of his personality, and that he is almost certainly the same person in his private life, as a father, a friend, and a professional. First, he is always very calm and very patient. These are qualities that are important when interacting with cats, but also in almost any social situation. John puts the cats' well being as his top priority. This means that he is not broadcasting the cam for his own needs, but in order to observe the cats. His other aims in setting up the cam are to inspire other people to foster cats in need, and to educate the public about cats and kittens in general. This sort of dedication to the object of his work is something we can all learn. When you are doing something, do it for the thing itself rather than for your own needs. If you end up with a feeling of achievement and satisfaction, and perhaps receiving appreciation from others, these are positive side effects, but should not be the rationale for our actions. Finally, John acts altruistically. Not only does he put the cats' well being first, he also cares deeply about the people who eventually adopt the cats, and about the cam's viewers. He wants to provide as many people as possible with positive interactions with cats. The first thing that people typically think about when they hear that someone is fostering kittens, puppies, etc. is “cute fuzzy babies!” It’s hard not to feel like rainbows & flowers when you’re looking at a tiny creature that only recently came into this world, still unable to care for itself. For the Foster Care Provider, we feel the same way, but we also face a world in which the skies occasionally darken. It’s not easy fostering animals - you dedicate many hours of your own time, pouring a little of your very soul into each tiny creature, only to say goodbye to them a couple months or so later as they are adopted into what we hope to be a good home. Then there are times that the foster is too sick or too weak and despite our best efforts pass from this world. Sometimes, we’re told to distance ourselves to prevent from being hurt - but that’s not possible, and we couldn’t even if we tried. People foster because they want to make a difference for an animal, to give them a better chance at finding a home to live out their lives with love & contentment. To best prepare the fosters for such a future, we have to spend time with them, interacting with them, showing them that it’s okay to trust people, to love people - which wouldn’t be possible if we kept our distance. Fostering is chock full of rewards though! Watching the animal open their eyes for the first time, taking their first steps, learning to run before learning how to stop - the milestones of their development met. Watching a semi-feral transition from being extremely fearful to curling up in your lap to sleep, watching the eyes of their adopters light up when they first hold their new family member. They fill our lives with glee as we take care of them until the day comes when we say goodbye - a day that is always bittersweet. For the first time fosterer, they look into their heart & soul, to see if it is strong enough to endure it again. If they find it so, they start the process anew. For some, their heart couldn't bear to part and they adopt their fosters - we dub them "Failed Fosterers" but there's never any malice in it for we secretly wished we did as well. This expresses very well the attitude that makes Foster Dad John a good person.